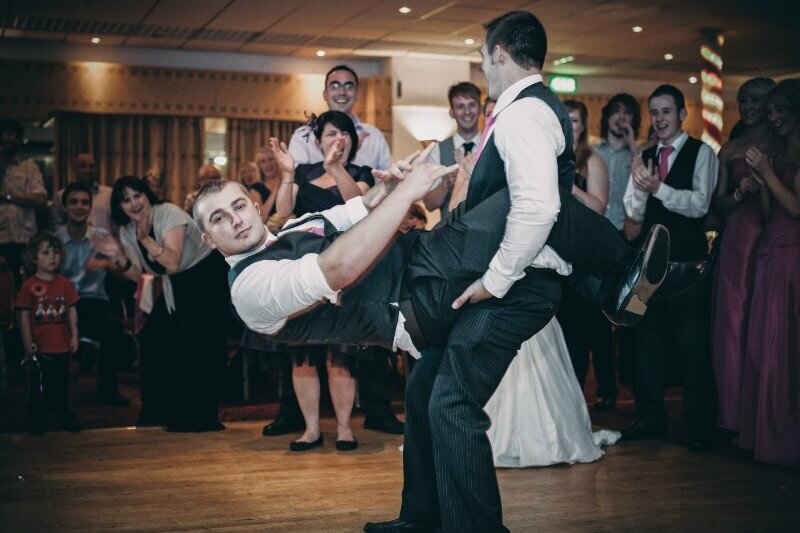 Every groom needs a best man who will break it down with him, in this case – literally. These two buds were caught in some ridiculous dance moves by the wedding photographer. Clearly, both the groom and his best man were totally elated for the special day, which is the most joyous part of the photo. They look pretty comfortable performing this slightly out-of-date dance move, which makes us think a little bit of practicing might have gone into it. 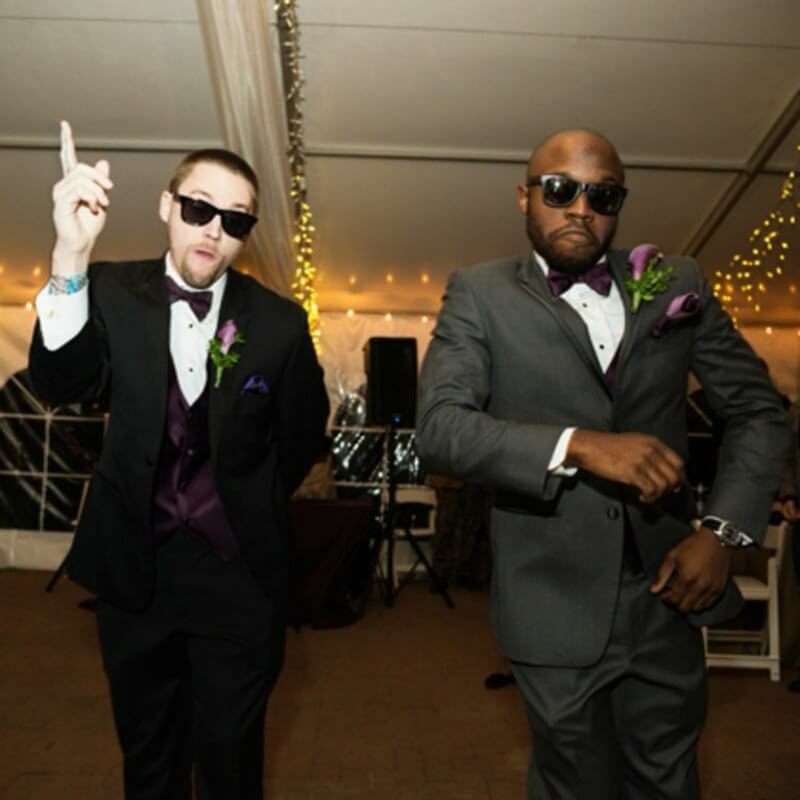 We wonder what kind of dance moves these guys broke out during the actual wedding reception! The main job of the best man is to have the Groom’s back no matter what. This guy definitely did not disappoint in that department. There is no way he could take his job more seriously than actually bringing a shotgun to a wedding photoshoot, to indicate just how serious he is about protecting his buddy and his bride. Unless, of course, the shotgun is trying to hint at something else entirely. Actually, this entire photo looks like it could be taking place on the set of a movie, but it is indeed real life. This wedding photo will definitely be one to look back on for years to come! This photo isn’t technically of the best man, however, it is definitely the doing of the best man. The original caption of this photo told quite an interesting story as seen through the eyes of a wedding guest. As the unsuspecting guest sat at the wedding of a friend, things got interesting when the best man asked for the rings. The groom held out his hand and the best man replied, “I don’t have them”. Soon the rest of the wedding party also checked their pockets to no avail. Then, in one fell swoop, this roller-skating gentleman glided down the aisle. That move definitely made one memory you will never forget! This entire photo set showcases the fantastic bromance between friends John Taylor and Andy Pemberton. The two have been best friends for over a decade. While the two are definitely close, they also clearly love to play up the humor in their friendship. John describes their friendship as “mutual idiocy”. When he began to plan his wedding with fiancée Lisa, the two buds decided to have some fun with a photoshoot. Often, the bride and bridesmaids will go all out in a photoshoot spectacular but this time the guys decided to have some fun. Their theme? The “ultimate bromance.” Taking in some TV while relaxing in two adjacent bathtubs? We don’t think a bromance can get any better than that. 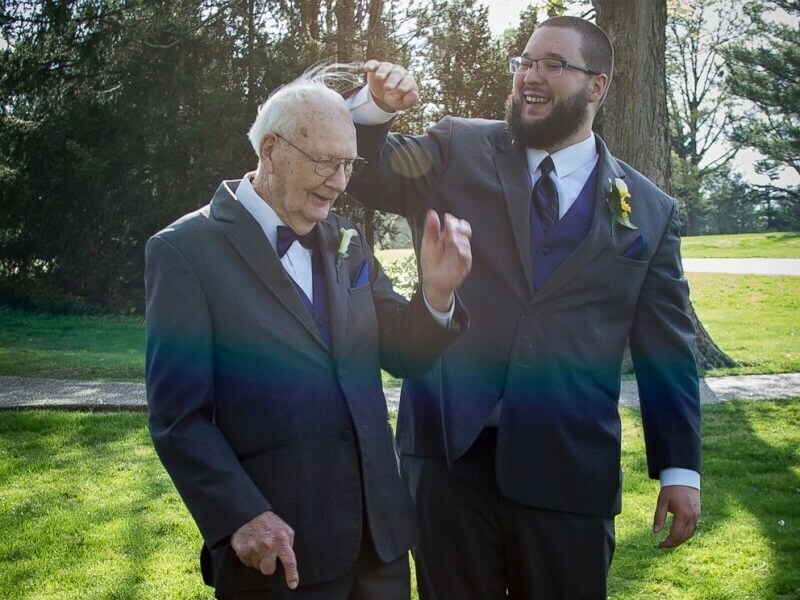 When KC Schafer started to plan his proposal to his future wife, Sarah, his 90-year-old grandfather Charles was by his side. KC took Charles with him when he picked out the engagement ring, so it only made sense that when the time came, KC would ask his grandfather to be his best man. KC said it best: “He has been my role model and idol since I was a little kid. I spend so much time with him. He pretty much modeled me into the man I am today.” Although Charles was unsure if KC would want “an old man up there”, KC couldn’t imagine anyone else as his best man. Charles also noted, “I was in eight weddings before and six of them I was the best man. When I wasn’t the best man they got divorced. But every one of the six when I was the best man, they were together ‘til they died.” Sounds like KC and Sarah are off to a great start! Some of the best bromances are those that are rather immature in nature. The kinds of friendships that make you feel like you could be a kid again. That is definitely true for the duo photographed here. The groom and best man took advantage of the wedding taking place at a church that just so happened to have a playground for kids. And what did they discover? Tricycles! Things can’t get more ridiculous or hilarious than two grown men going for a simple ride on a tricycle. We wonder if these guys have been friends since their toddler years — that would definitely make for one sweet throwback photo comparison! Your best man could definitely be compared to being a “trusty steed” — that is if he’s a good one anyway. A best man should be dependable, the friend that you can always call no matter what is going on in your life. These goofy guys definitely took that to heart and also decided to recreate a literal depiction for the wedding photographer. Either that, or there was a little be too much free-flowing booze. We bet all the guests will surely remember the groom and best man antics from this wedding. Not to mention the kind of creepy horse mask! Some of the best friendships are the ones where you can totally be yourself and that includes being a total weirdo. This best man and groom definitely took that statement to heart and you can see that they are killing it on the dance floor! You can even tell how excited the rest of the wedding party and guests are in the background, including the bride, watching the shenanigans unfold. If this is how the guys were acting at the actual wedding, we can only imagine what kind of insane debauchery they probably got into during the bachelor party! These guys wear their sunglasses at night and they are definitely not afraid to bust a move. In fact, it looks like the two are in the middle of a strictly choreographed dance. While choreography has been all the rage in recent years, it makes it even better when members of the wedding party surprise the bride or groom. In comparison with the previous groom and best man dancing photo, we have to say these guys look a bit more skilled in the moves department. We wonder what song they were getting down to?! Everyone knows that the real best man is man’s best friend: the dog. No buddy can compare to the unconditional love your best dog friend can give you. Some grooms have chosen to go a step further and actually have their beloved pet serve in their wedding as their best man. Dogs definitely have all the qualities needed for a best man: dependable, loyal, and can probably keep track of the wedding ring. Not to mention, dogs aren’t with us forever. So what better way to memorialize their memory forever than the most special day of your life? This photo shows Craig Bain from Buckie, Scotland who served as his brother Ryan’s best man. Craig really went all out in his duties and decided to craft a hilarious song rather than say a run of the mill speech. The song was set to the tune of “The Wild Rover”, an old Irish folk song. The hilariousness of the song made it immediately go viral. Some of the lyrics included: “Well I have known Ryan for 22 years, I still can’t believe he got Cherie [the bride] here. Now once I have versed and dropped my guitar, Ryan is treating us to a free bar.” He also made some off-the-cuff remarks and gave his brother a hard time as per usual with siblings. This adorable wedding photo shows the bond between the groom and best man, who is clearly stoked his friend landed such a beautiful bride. It’s always nice to see friends that are truly happy for one another, especially when it concerns entering into a new phase of your life. Perhaps even more hilarious in this photo is the face of the maid of honor, who looks totally fed up with the goofiness shared between the groom and best man. Maybe she is not quite as stoke that she’s losing her best girl to marriage! This crazy looking Best Man definitely took the party-loving ways of his role to new heights. 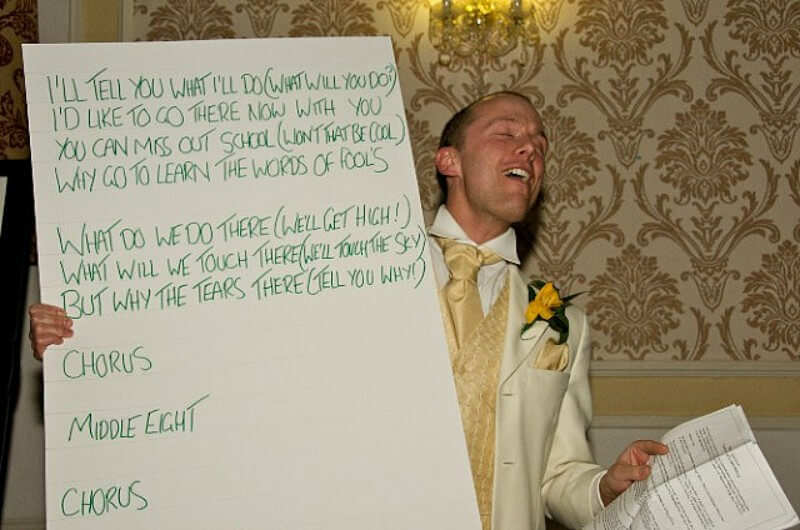 This gentleman is shown holding cue cards with the lyrics of the song “Itchycoo Park” by the Small Faces, presumably for the rest of the wedding party and guests to sing along with. We aren’t sure of the significance of the song but judging by the groom’s face he takes singing along very seriously. Also, is it just us or is he kind of dressed like Jim Carrey’s character from Dumb and Dumber? If there is one thing awkward about taking staged wedding photos, it’s what to do with your hands. 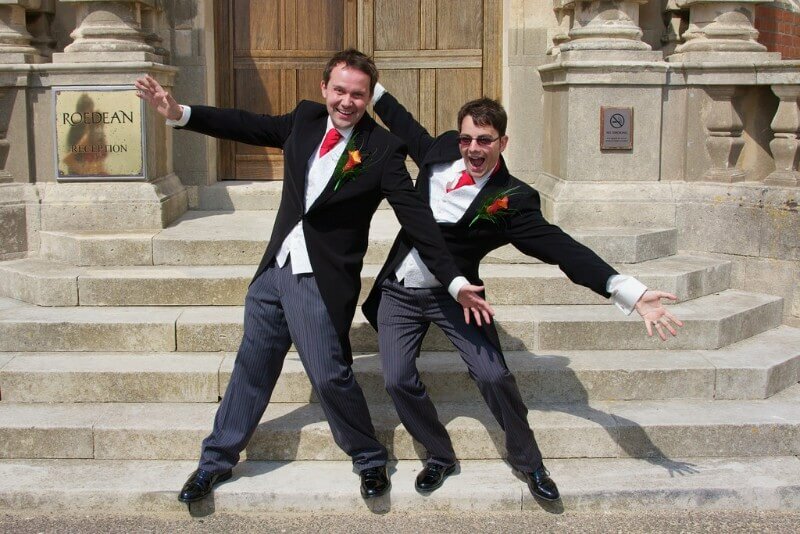 This funny groom and best man duo decided to do something a little on the extra side by throwing up jazz hands! The two definitely looked excited to be there on the special day and they also look like they could definitely pull off a rousing rendition of a Broadway song and dance number. Many men wouldn’t necessarily jump to jazz hands right away, so we suspect this duo might have some dancing history. We can only hope that the wedding reception included some fun choreography. 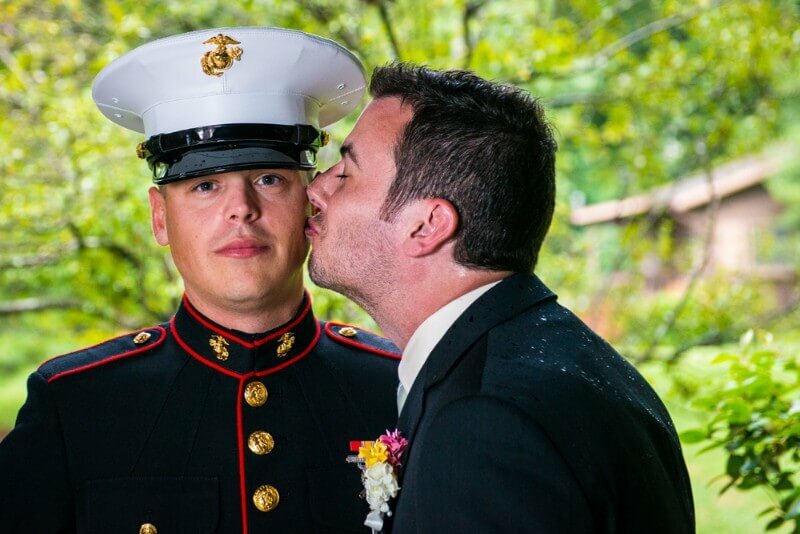 This adorable photo showcases a best man planting a kiss on the cheek of his best friend, the groom. It just so happens that the groom is a Marine decked out in his dress uniform, which makes it all the sweeter. Marines have the reputation of being one of the toughest military branches so to see a member allowing a kiss on the cheek by his best friend is super heartwarming! Although the best man is not in any uniform it’s possible that the two served together which would explain their close relationship. How sweet it is to have such a great bromance! When 28-year-old Charles Powell decided to tie the knot with his now-wife Myra, he knew he had to call upon the best friends that he had in life. It just so happens that these best friends met online. Charles said that he first met his friends on Xbox Live when he was 13 years old. 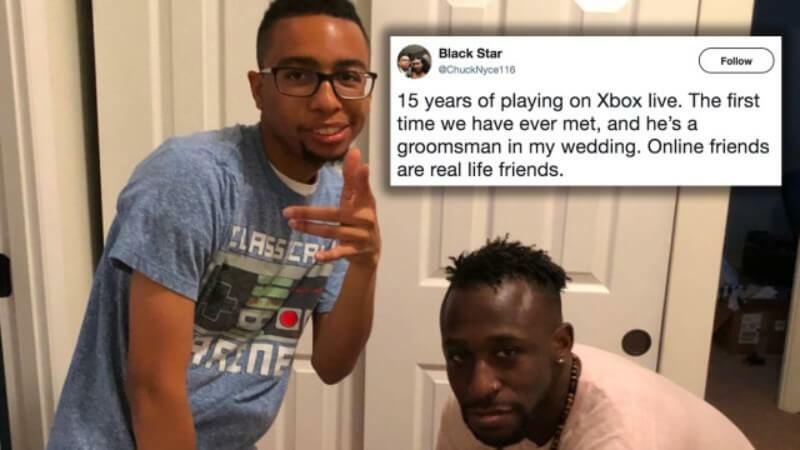 The four friends played Xbox together for years but never met in real life until they all met just before the wedding. The four guys were all from different states. The first person who Charles met was Joe Walters and then their other two friends named William Brown and Joey Morris joined up. Charles later shared his story on Twitter with a photo and the caption, “online friends are real friends”, which spurned many stories from other Internet users who met their friends online. Oh yeah, Charles also met his wife, Myra, on OkCupid. If you are a groom and best man in search of the perfect wedding photo shoot, look no further. These guys have definitely covered all the bases. These guys are going through a huge amount of emotions — from panicked, to joyous, to loving, to scared. There is something here for everyone. But seriously, the photos are really beautifully taken, with amazing photography work, and also do the job of showcasing the intricacies of a friendship. Although wedding photoshoots usually center around the bride we think it’s great that men are now getting in on the fun! Back in 2011, Prince Harry served as the best man to his brother Prince William’s groom. Although, in England, best men are usually referred to as “supporters”. According to those who were present, Harry supposedly made a funny speech aimed at his brother as well as some of his older relatives (the Queen, perhaps?) Allegedly, Prince Charles also made some jokes at the same time and even poked fun at William’s baldness! Needless to say, the shoe is about to be on the other foot with Harry’s marriage to American Meghan Markle on the not-so-distant horizon. We can only imagine what kind of best man William will be to Harry. 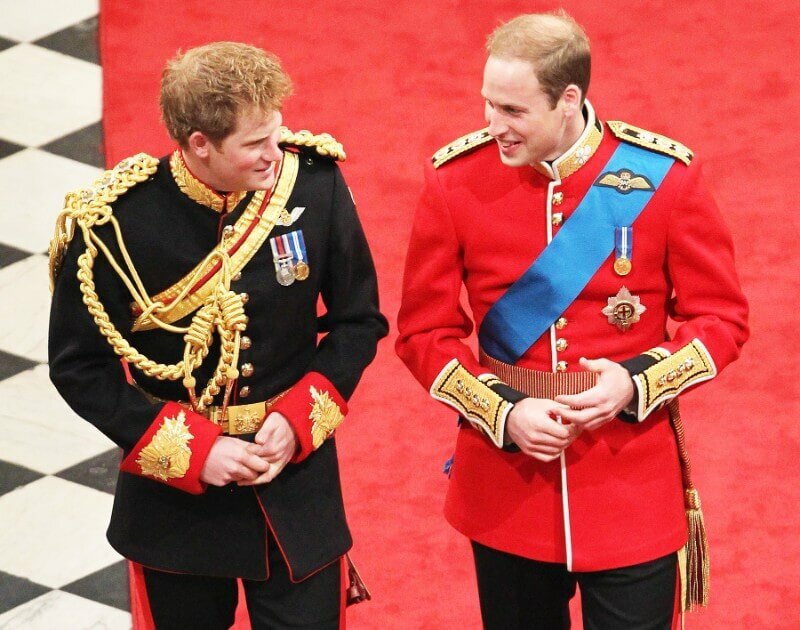 Also, how fantastic is this photo of the two brothers sharing a laugh during William’s wedding? !